Did you know that, every day, your grandparents use something that Benjamin Franklin invented over 250 years ago? Did you know that part of your car was invented by Benjamin Franklin before cars were even invented? Did you know that Benjamin Franklin created something that changed TIME for you today? Oh, there is so much more to know about this great man who lived in the American colonies in the 1700s! Come read, Now and Ben, Modern Inventions of Benjamin Franklin and How Ben Franklin Stole the Lightning! A 7-page unit for the paired books, Now and Ben, Modern Inventions of Benjamin Franklin by Gene Baretta and How Ben Franklin Stole the Lightning by Rosalyn Schanzer is part of a collection of 42 units in Reading Seeds. Now and Ben and 42 other award-winning books are available in Reading Seeds in a clearance sale! 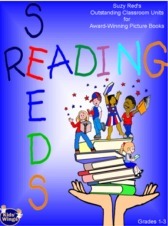 All 43 units with readers theater script, puzzles, comprehension checks, writing lessons, math, and fun for only $25 or $.58 each. A special thanks to Laura's Midi Heaven for the delightful background composition "Yankee Doodle" as our background music!